Beer nog aka eggnog made with ale is actually how the holiday drink that is so popular today originated. Did you know? Nog was popular in Norwich, a city in England, about four centuries ago. From The Glossary of Terms Used in East Anglia I pulled the following two definitions for you. Nog used to mean ‘a sort of strong, heady ale’ and the term noggin was used to signify ‘a small measure or a pot of ale’. Sir Robert Walpole, the man considered the first effective prime minister of Great Britain was said to have passionately favored nog. This takes care of the ale connection and sheds light on why beer comprises the origins of eggnog beer nog. But what about the egg part of eggnog? And what about the milk, cream, sugar and later on whiskey or rum added to the drink? In addition to the strong, dark ale referred to as nog the wealthier English of the seventeen and eighteen hundreds used to indulge in a mixed drink called posset. Posset was a spiced mixture of hot milk and ale or wine. Eggs were often added. The wealthy townspeople were the ones who primarily took pleasure in this milk punch because fresh milk and fresh eggs were not easy to come by in those days without refrigeration. Cows and chickens preferred to live in the countryside and the farms belonged to the affluent. Making posset involved boiling some milk, adding either wine or ale, letting it cool and gathering the curds while discarding the whey before seasoning the concoction with ginger, cinnamon, candied anise and sweetening it with sugar. Not sure how I feel about a curdled milk cocktail. Eventually room temperature nog (or often fortified wines like Madeira and Sherry) were added to posset. In the case of nog’s union with posset a popular craft beer cocktail was concocted! Sweet, strong ale and custard. No curds. Yum! It probably was very similar to and looked much like this one below. 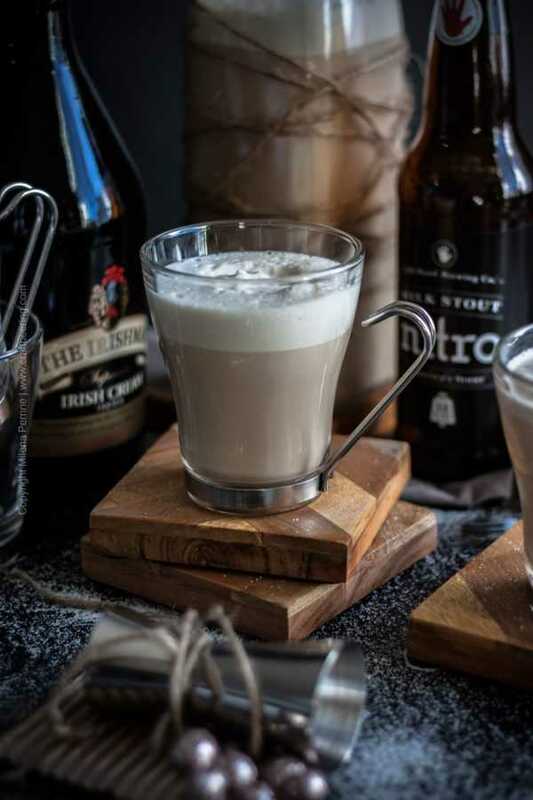 The early immigrants to America began adding rum and then bourbon to the milk custard cocktail, the ale element was overlooked and the concept of beer nog faded away. The name eggnog came into play, describing the drink as you know it today. But for the sake of flavor (and great flavor at that) – I present you with the Perrine Irish-ed version of the original eggnog. We make it with a very generous quantity of Irish cream. And nitro milk stout. I really do not want to hear what an Englishman might have to say about the historically inaccurate inclusion of Irish cream. I plan on keeping my bubble inflated for as long as possible:). We use a creamy and sweet nitro milk stout (carbonated with nitrogen for the tiniest of bubbles, very, very smooth) which is sweetened by lactose (typically nitro stouts are not). 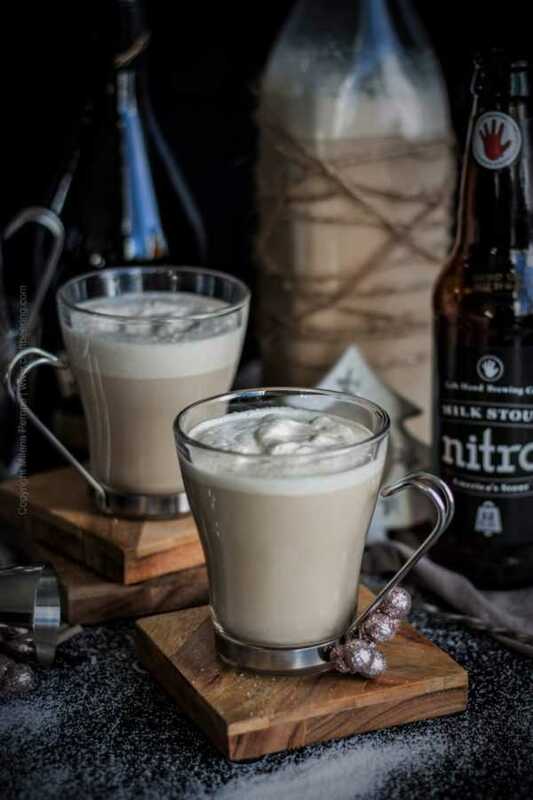 Our usual selection is easily America’s most famous nitro ale with lactose – Milk Stout brewed by Lefthand Brewing Company, just thirty minutes down the road from where we live (but distributed nationally). Milk Stout has unbelievably alluring notes of roasted malts and coffee and a velvety, smooth mouthfeel you will never forget once you try it. You must try it. Beats Guiness any time. But if you cannot find it, use Guiness as a substitute (and fortify the Irish theme that doesn’t belong:) or use another nitro stout. You will first need to mix the custard base of the beer nog by beating the eggs, dairy ingredients and the sugar. Flavor with vanilla and nutmeg and add the ale (nitro stout for best results) and the whiskey Irish cream. Once you mix all the ingredients the resulting beer nog will have this lovely, silky, thick foam on top. Sooo good! 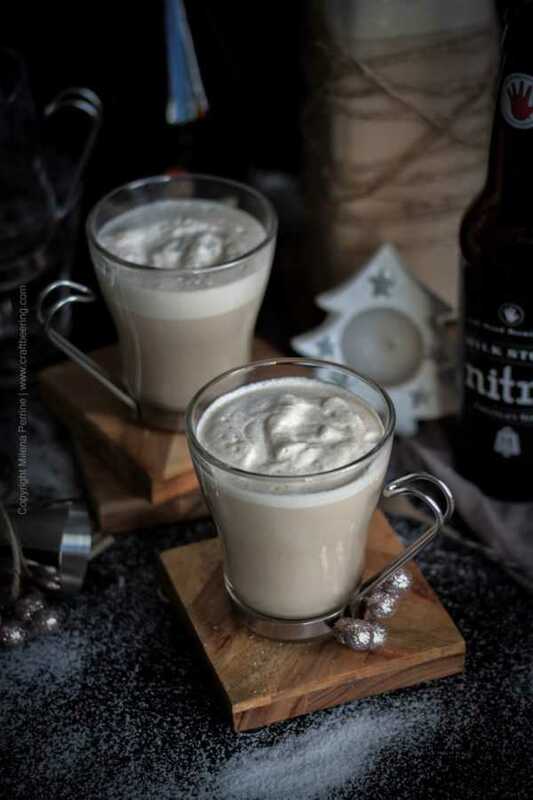 If you want the beer nog to taste even stronger (I am only suggesting this because I have heard of people mixing one part store bought eggnog with one part bourbon to = rocket fuel) you can always add a shot or two of Irish whiskey (again in keeping with the Irish theme). Just remember, that as it is, our beer nog is already quite strong. The lack of alcohol burn is accompanied by a ridiculous degree of treachery. So watch out if you do add whiskey. 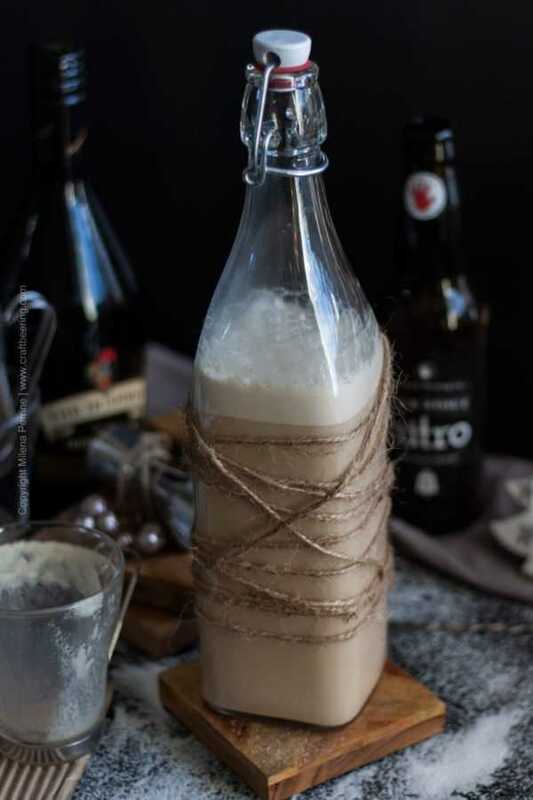 You can store the beer nog you prepare in a bottle or an airtight pitcher in your refrigerator for a few days. There will be no more magic foam at the next pouring, but it will taste just as good. That being said of course, since there are raw eggs, be careful. If upon taking the stout eggnog out of the refrigerator it smells strange or looks suspicious – you know what to do. Discard the thing and mix a new batch. Amazing what you can do with beer – Thanks for sharing at the What’s for Dinner party! This seems like a very interesting twist on eggnog. I never loved eggnog but maybe this will be different. This looks great and I love Lefthand Brewing. They are the bomb! Thank you, Debbie. Eggnog is a definitive yey or nay kind of drink, isn’t it? I actually introduced my brother and Mom to eggnog years ago. I really enjoy my own homemade version. This one sounds super good and the addition of stout I expect would curb the richness of it. Thanks, Leanna. You are right – adding stout and Irish cream does help with the richness and introduces more in flavor complexity to distract from the eggs’ thickness and the creaminess. What a compelling story! I did not know any of that. And eggnog was unknown to me until not long ago. I am not crazy about it, but I am thinking I might love your stout and Irish cream version a lot more! Great job, as always! Thank you, Nicoletta. 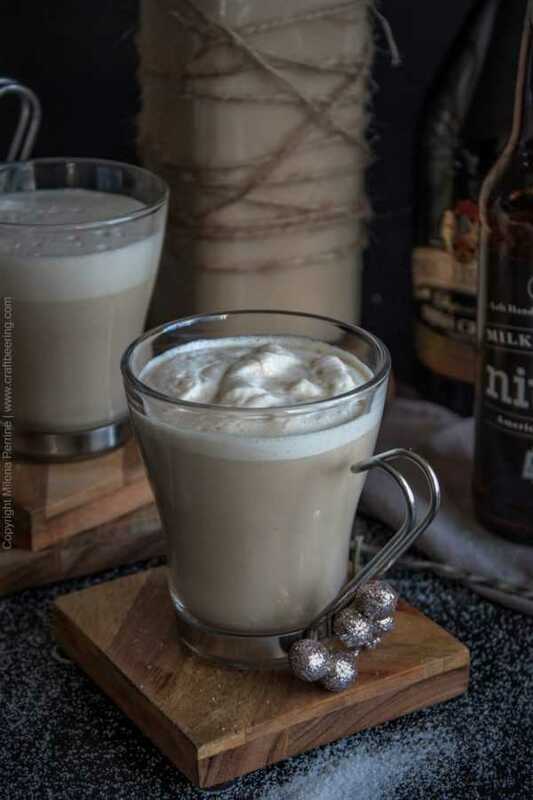 I bet you’d love it with stout and Irish cream, so much more by way of flavor complexity over plain eggnog. I only started drinking eggnog when I hubby and I started dated waaaaay back when. I didn’t grow up with it, but he did and now I love the stuff….though, I’ve never made myself. This beer nog looks and sounds fabulous!! Definitely have to try this one over the holidays and I’m sure it’ll be a million times better than any regular ‘ol store bought nog 🙂 Cheers to an awesome weekend! Well, I am so glad you are on the yey side of eggnog now:) I agree with you – kind of hard to understand why you would buy from the store, along with all the chemical stabilizers when it is sooo easy to whip up some and flavor it any way you like. I’ve been thinking of a raspberry stout version and also adding a bit of cocoa instead of just nutmeg. Maybe it will taste like chocolate raspberry cake..Faintly. Chris and Milena, this looks and sounds marvelous! 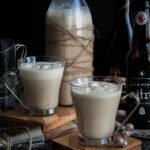 I’ve always used brandy in my eggnog, maybe rum once or twice, but have never thought to use stout! We think you will like the flavors from the stout:) Thank you, Jean for stopping by! I love the mood of your photos! They draw me in, every time! Like Kelsie, I’ve never really thought about the history of eggnog – so thank you for enlightening me! I learn so much when I come here! My dad used to make it from scratch every year, so it’s always held a special place in my heart. I love your creative twist!! I always wondered what posset was! This is so interesting–I never even thought about the history of eggnog before today. Your pictures are just STUNNING and I’d love to have a mug of beer nog in front of me right now :). Have a great weekend! It would be the perfect thing to sip on to accompany your chocolate eggnog pie, Kelsie! It will be a match made in heaven. Posset can remain in history as far as I am concerned, lol. Somehow not into curdled milk. But maybe it was good, who knows. Thank you and have a great weekend too!